This most charismatic and beloved of whales was subject to centuries of intense -- and eventually illegal -- hunting pressure. In the days before whaling, up to 1.5 million humpbacks roamed the worldwide oceans. In the 19th and 20th centuries, these numbers were all but wiped out by commercial whaling. Today, humpbacks are tightly protected and recovering with an estimated 80,000 worldwide, though Japan plans to resume hunting of humpbacks in the next two years. COMING SOON: The Undersea Singer: The humpback whale is famous for its beautiful and dramatic singing. 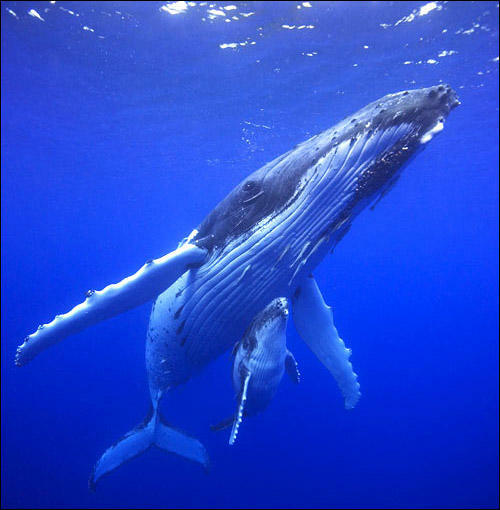 Find out more about the evolving culture of humpback songs. COMING SOON: The Watchable Whale: Whale-watching is a $1 billion a year business, and the spy-hopping, breaching humpback is typically the main attraction. Find out more. COMING SOON: Humpback Whaling Through the Years: From early attempts to exploit the humpback to devastating and illegal hunting in the 20th century, uncover the history of humpback whaling. COMING SOON: A Return to Hunting Humpbacks? : Why are the Japanese planning a return to humpback whaling? Find out more about this pressing issue.